Hi, I am interested in your 1979 Dodge Li'l Red Express (stock #4902-CHA) listed on Autotrader for $23,995. I'd like to get more information about this vehicle and confirm its availability. The 1979 Dodge D150 Lil Red Express is the bold outlaw that got us hooked on sports trucks. Its a story that people love to tell about how one company gave the people the V8 power they really wanted but were shut down after a couple of years. And the few people that get to tell this rare tale are the lucky few who can find a shining example like this. The Dodge boys were truly flying in the face of regulations as they allowed their cop motor to hit the streets. A loophole let it go into trucks, so they decided to be as bold as possible with their defiance. Thats how you get a Canyon Red pickup with oak wood bolted to the sides. And oh yeah, there are two gleaming vertical exhaust stacks extending above the roof line. But being a rebel didnt come cheap, and Dodge only sold around 5,120 examples in 1979 the final year of this rare two-year offering. This example really looks both correct and highly original right down to the details. The new for 79 front end is gleaming; the chrome slotted Mag wheels are still mirror-like; and of course, everyone loves the full gold decal package that was another reminder of this pickups defiance. The interior is the perfect mix of pickup and performance, and the seat shows this off the best. You have a wide bench that can sit three across. But when the folding armrest is down, theres the kind of individual comfort youll find in the best muscle cars. The black of the seats coordinate with the door panels, dash, and carpeting for a deep and dark presentation. Similar to the exterior, theres some nice wood-like trim for added flair. The driver-oriented dash gives you all the gauges directly in front of you, as well as an easy reach to everything from the heat/defrost controls, to the upgraded AM/FM/cassette stereo. The motor is a big part of the appeal of the Lil Red Express, and so its great to see this one looking tidy with plenty hints of originality. They snuck a cop motor into the Lil Red Express, and so it made them the true hot one. It inhales through a four-barrel carburetor, and youll never get tired of the sound from the exhaust stacks that offer a unique high-rise high-performance soundtrack. While this is meant to be the ultimate outlaw truck, its quite easy to tame on the streets thanks to the thick front sway bar, three-speed automatic transmission, power steering, and recently serviced front disc brakes. Plus, those who want to use this rare classic for full truck duty can even take advantage of the added tow hitch. 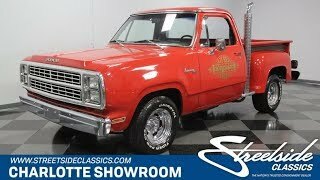 If you like rarity, distinction, and an outlaw history, then dont let this muscle Mopar truck slip away. Call now!